This item is 5 years and 8 months old; some content may no longer be current. Multiple sclerosis (MS) is an inflammatory disease of the central nervous system (CNS) resulting in neurological deficits, which can take a variable course. Peak onset occurs between age 20 and 40 years.1 MS should be diagnosed definitively by a Neurologist, following clinical assessment combined with MRI evidence of typical lesions occurring on separate occasions, in different locations within the CNS. Multiple sclerosis (MS) is an inflammatory disease of the central nervous system (CNS) resulting in neurological deficits, which can take a variable course. Peak onset occurs between age 20 and 40 years.1 MS should be diagnosed definitively by a Neurologist, following clinical assessment combined with MRI evidence of typical lesions occurring on separate occasions, in different locations within the CNS. Chronic disability is a feature of MS. The primary care team will co-ordinate care with the patient’s partner/family, carer and specialist health professionals, to reduce MS-associated complications and to assist with personal and family adjustment. Disease-modifying medicines may reduce the number of relapses a person with MS experiences, but there is no treatment which is effective at slowing the disease once in the progressive phase. MS is characterised by inflammatory demyelination (damage to the myelin sheath of the neuron), which occurs within the white and grey matter of the CNS.6 The peripheral nervous system is unaffected. Inflammation causes a loss of myelin and neuronal/axonal injury. Over time, remyelination can repair some of this damage. Plaques are formed from dense clusters of supporting cells (gliosis) surrounded by fibrous material. The location, frequency and balance of injury versus repair determines the pattern of MS and its associated disability. MS has a highly unpredictable course and prognosis. Communicating this uncertainty can be a challenge for clinicians and result in anxiety for patients and their families. After a period of months to years a cycle of recurrent symptoms may develop that allows a pattern of MS to be identified. The pattern of MS that a person has will affect their prognosis and may influence the treatment of their condition. MS typically begins with a sudden episode of neurological symptoms. 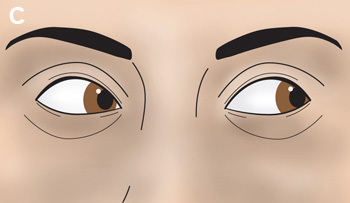 For example, the patient may report blurring of vision in one eye (optic neuritis), double-vision (diplopia), unsteadiness, sensory impairment spreading upwards from the legs or dysfunction in the limbs.3 The symptoms are characterised by increasing severity over days, then stabilisation over days to weeks, followed by gradual resolution which will be complete or partial after several weeks.7 The first episode is often referred to as a “clinically isolated syndrome”.7 Later, following a second clinical episode, or subclinical changes on MRI (see: “The McDonald Criteria”), the patient may be diagnosed with relapsing-remitting MS.
“Benign MS” occurs in approximately one in ten people with MS.1 This is diagnosed following a period of ten to 20 years without significant disability.1, 7 However, many patients do still develop disability and the value of this diagnosis is controversial. General Practitioners should consider MS as a possible diagnosis when a person aged 20 – 50 years presents with symptoms and signs suggestive of a focal CNS deficit. In this situation, a neurological referral should be considered. Diagnosis of MS is confirmed by the presence of characteristic lesions on MRI (see: “The McDonald criteria”). 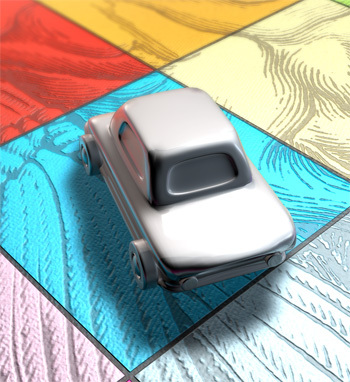 Optic neuritis and MS are closely linked. Visual impairment due to optic neuritis is the reason why one-quarter of people with MS present to a clinician, and more than half of people who present with optic neuritis will eventually develop MS.1 Like MS, optic neuritis is more prevalent among younger women, Europeans and in people who live further from the equator.9 However, there are alternative diagnoses that should also be considered, and people with optic neuritis will not necessarily develop MS.
After an attack of optic neuritis the optic disc may appear pale, compared to the unaffected eye, suggesting optic atrophy. Typically, vision will improve over time which helps to differentiate the episode from a progressive cause of impaired visual acuity, e.g. glaucoma. 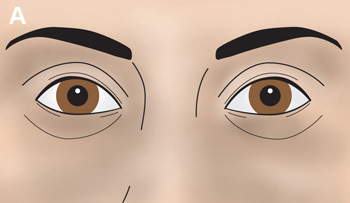 Internuclear ophthalmoplegia in MS is caused by damage to neuronal connections in the brainstem between the abducens (VI) and oculomotor (III) cranial nerve nuclei.10 This prevents the eyes working as a single functioning unit and affects horizontal gaze. 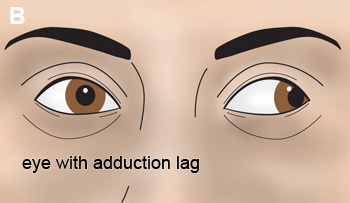 When the patient looks laterally to the unaffected side there is impairment of adduction observed in the affected eye, which lags behind the unaffected eye, as shown in Figure 1.11 Fast involuntary movements (nystagmus) of the unaffected abducting eye are also often seen. Oligoclonal IgG bands in cerebrospinal fluid present on protein electrophoresis are found in up to 95% of people with well established MS.7 However, protein electrophoresis of the cerebrospinal fluid is rarely required where a characteristic clinical history and MRI changes are present. Patients with active relapsing-remitting MS may be treated with disease-modifying medicines. There are three such medicines for MS available in New Zealand under Special Authority; glatiramer acetate, interferon beta-1a and interferon beta-1b. Subsidy for these medicines requires application from a Neurologist to the Multiple Sclerosis Treatment Assessments Committee. The subsidy approval criteria include that the patient has frequent relapses and significant residual disability. The medicines are sent by courier directly to patients or clinicians (i.e. not dispensed from a pharmacy). General Practitioners may assist in monitoring for adverse effects in patients taking these medicines. Interferon beta-1a (Avonex) is available in 30 micrograms vials and prefilled syringes and pens which are injected intramuscularly, once a week.13 Interferon beta-1b (Betaferon) is available in 250 micrograms vials, with a reconstituting solvent, and is injected subcutaneously, every second day.17 Beta-interferon may cause influenza-like symptoms and occasionally vomiting.13 Less common adverse effects include anaphylaxis, urticaria, personality changes and suicidality, convulsions, hepatitis and thyroid dysfunction.13 Dose titration may be necessary to improve tolerability. There are four other monoclonal antibodies, mainly indicated for the treatment of leukaemia or prevention of organ transplant rejection, that have been trialled in the United States as disease-modifying medicines for MS; alemtuzumab, daclizumab, ocrelizumab and ofatumumab.18 However, evidence of effectiveness for the treatment of MS is inconclusive and some of these medicines have been withdrawn from clinical use. Could a virus or other infection be the trigger? Are the symptoms an adverse effect of treatment? Are the symptoms explained by the gradual progression of MS? Management of symptoms usually involves consultation with other members of the multi-disciplinary team. Check the New Zealand Formulary for medicines information and subsidy status. Pain affects up to two-thirds of people with MS.1 Musculoskeletal pain can be caused by restricted movement or muscle spasms.1 Peripheral pain can be managed with analgesics and physiotherapy. CNS lesions may also cause pain, especially if there are lesions affecting sensory pathways, e.g. trigeminal neuralgia may occur due to brainstem inflammation.1 Table 1 lists medicines for the treatment of chronic pain. Bowel dysfunction, e.g. constipation and/or faecal incontinence affects over 60% of people with MS.1 This can be highly detrimental to the patient-carer relationship and is a common reason why people with MS are admitted to residential care.1 Fluid and fibre intake should be increased before a laxative is considered.1 Overflow incontinence, secondary to constipation, should also be considered as a possible cause. Spasticity and spasms frequently occur in people with MS and affect mobility. Physiotherapy in combination with passive exercise is used to prevent permanent muscle shortening. Table 2 lists medicines for the treatment of severe spasticity. Depression and/or anxiety are likely to be experienced by people with MS, and also carers or family members.1 Over half of people with MS will have a major depressive episode and the rate of suicide is reported to be 7.5 times higher in people with MS.1 The patient, their carer and family require opportunities to talk about the impact MS is having on them as well as having input into how positive change can be made. Referral for counselling is recommended. Baclofen 5 mg, three times daily, increased at three day intervals by 5 mg, three times daily. The maintenance dose is 30 – 80 mg daily, in three divided doses. Dantrolene 25 mg, once daily, increased after four to seven days to 25 mg, two to four times daily. Doses can be increased further by 25 mg, every four to seven days, to a maximum of 100 mg, four times daily. *Fampridine (Fampyra) is a potassium channel blocker indicated for improving walking in adults with MS. One month free trial is available in New Zealand, however, ongoing treatment is expensive and not subsidised in New Zealand. Diet should be reviewed in patients with continual weight loss or evidence of malnutrition. It is possible that there are additional benefits to improving nutrition in people with MS, and some guidelines suggests that a diet rich in sunflower, corn, soya and safflower oils may slow disease progression, however, the evidence for this is not strong.7 The “Swank Diet” is gaining popularity in Australasia, largely due to the fact that it is being promoted by a clinician who himself has MS. The diet is low in saturated fat and high in vegetables, but there is currently no controlled evidence of benefit. For further information see: “Vitamin D supplementation: Navigating the debate”, BPJ 36 (June 2011). Thank you to Dr Ernie Willoughby, Neurologist, Auckland DHB, Senior Lecturer, Department of Medicine, University of Auckland and Patron and Medical Advisor, Multiple Sclerosis Society of New Zealand for expert review of this article. Simon C. Multiple sclerosis. InnovAiT. 2009;2(4):205–12. MacLurg K, Reilly P, Hawkins S, et al. A primary care-based needs assessment of people with multiple sclerosis. Br J Gen Pract. 2005;55(514):378–83. Hawker K, Frohman E. Multiple sclerosis. Prim Care. 2004;31(1):201–26. Taylor BV, Pearson JF, Clarke G, et al. MS prevalence in New Zealand, an ethnically and latitudinally diverse country. Mult Scler. 2010;16(12):1422–31. Simon KC, Munger KL, Ascherio A. Vitamin D and multiple sclerosis: epidemiology, immunology, and genetics. Curr Opin Neurol. 2012;25(3):246–51. Tsang BK-T, Macdonell R. Multiple sclerosis- diagnosis, management and prognosis. Aust Fam Physician. 2011;40(12):948–55. Coles A. Multiple sclerosis. Pract Neurol. 2009;9(2):118–26. Scalfari A, Neuhaus A, Degenhardt A, et al. The natural history of multiple sclerosis: a geographically based study 10: relapses and long-term disability. Brain. 2010;133(Pt 7):1914–29. Osborne BJ, Volpe NJ. Optic neuritis and risk of MS: differential diagnosis and management. Cleve Clin J Med. 2009;76(3):181–90. Prasad S, Galetta SL. Eye movement abnormalities in multiple sclerosis. Neurol Clin. 2010;28(3):641–55. Charles J, Valenti L, Britt H. Multiple sclerosis. Aust Fam Physician. 2011;40(12):947. New Zealand Formulary (NZF). NZF v13. NZF; 2013. Available from: www.nzf.org.nz (Accessed July, 2013). Roskell NS, Zimovetz EA, Rycroft CE, et al. Annualized relapse rate of first-line treatments for multiple sclerosis: a meta-analysis, including indirect comparisons versus fingolimod. Curr Med Res Opin. 2012;28(5):767–80. 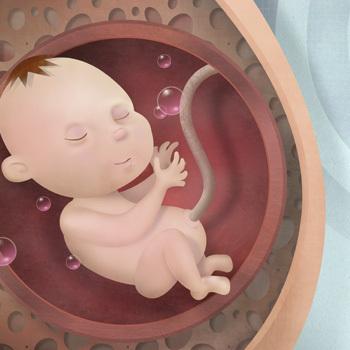 Mantia LL, Vacchi L, Rovaris M, et al. Interferon β for secondary progressive multiple sclerosis: a systematic review. J Neurol Neurosurg Psychiatr. 2013;84(4):420–6. Carter NJ, Keating GM. Glatiramer acetate: a review of its use in relapsing-remitting multiple sclerosis and in delaying the onset of clinically definite multiple sclerosis. Drugs. 2010;70(12):1545–77. Bayer New Zealand Limited. Data sheet: betaferon. 2010. Available from: www.medsafe.govt.nz (Accessed Jul, 2013). Nicholas J, Morgan-Followell B, Pitt D, et al. New and Emerging Disease-Modifying Therapies for Relapsing-Remitting Multiple Sclerosis: What is New and What is to Come. J Cent Nerv Syst Dis. 2012;4:81–103. National Institute for Health and Care Excellence (NICE). Multiple sclerosis: Management of multiple sclerosis in primary and secondary care. London: NICE; 2003. Available from: www.nice.org.uk (Accessed Jul, 2013). Pucci E, Branãs P, D’Amico R, et al. Amantadine for fatigue in multiple sclerosis. Cochrane Database Syst Rev. 2007;(1):CD002818. U.S. National Institutes of Health. Aspirin for treatment of multiple-sclerosis-related fatigue. 2013. Available from: clinicaltrials.gov/ct2/show/NCT00467584 (Accessed Jul, 2013). Preziosi G, Emmanuel A. Neurogenic bowel dysfunction: pathophysiology, clinical manifestations and treatment. Expert Rev Gastroenterol Hepatol. 2009;3(4):417–23. NZ Transport Agency. Medical aspects of fitness to drive: a guide for medical practitioners. NZ Transport Agency; 2009. This article is 5 years and 8 months old.